'Raise Your Voice Joyce - Contemporary Shouts from Contemporary Voices' LP is now streaming in full and vinyl shipping out next week! 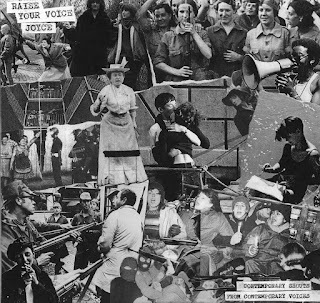 "Contemporary shouts from contemporary voices charting a small piece of the limitless history of women in revolt. Eight tracks; each one a history; a story; a biography, told through disparate styles, from early anarcho punk and UK82 to DIY snapshots of goth crossover – all bound together to cement an activated and radical disruption vita. Joyce is the revolting woman; a constant of history. Contributions from members of today’s UK and European punk scenes (Nekra, Subdued, BB and The Blips, Game, Good Throb, Arms Race, Sauna Youth, Terrible Feelings and more), RYVJ is a command, a demand and a well-spoken message for tomorrow." The 12" comes in a wraparound sleeve and an additional insert with lyrics and essays from all contributors.